This month marks the second anniversary of the passing of Julie Rich. As of today, her three books are now available both as Kindle ebooks and in softcover. Click on any of the book covers above to order directly from Amazon.com. Today is the five-month anniversary of Julie's passing. 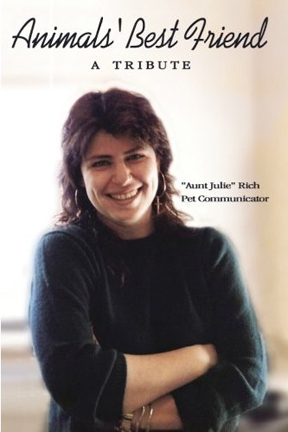 Today is also the publishing date of Animals' Best Friend - A Tribute, the first book by "Aunt Julie". 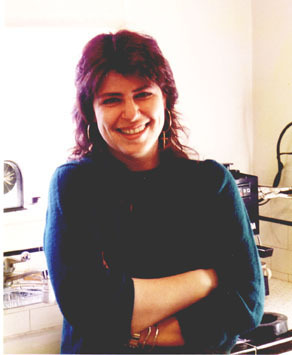 There will be two more books in the series, Secrets of a Pet Psychic to be published on Julie's birthday, April 24, and Listening to the Silent Majority, to be published on August 6, the first anniversary of her passing. These three volumes will encompass all her writings on the subject of Pet Communication. The family of "Aunt Julie" wants to wish you a happy and healthy holiday. Please "friend" Julie's Facebook page at this link: facebook.com/auntjulierich. This way we can keep you notified when her first book is published, which should be in the next few weeks. Her Twitter page is here. Thank you for the outpouring of love the family has received in the months since Julie's untimely passing. This is Sharon Rich again, Aunt Julie's sister. I have a very sad update to report to you, her dear friends. If you feel that a refund for services not delivered is appropriate, please email petcomm@aol.com and I will periodically check that email and arrange for a refund. In the early evening last night, Julie very suddenly suffered a pulmonary embolism and was not able to be resuscitated. For the time being, this website will remain as-is so that people can refer to Aunt Julie's articles, useful information and success stories. Julie and I had talked about putting together a book of her advice and success stories and had made some progress on it. I will try to finish up the project based on her notes and will publish it on her behalf at a later date. Details will be posted here on the website at that time. Per Julie's requests there will be no funeral. Our family requests no flowers but if you wish, please make a donation to any animal shelter in her name. If you would like to share your thoughts about Aunt Julie, I have set up a condolence page on Facebook. Let's celebrate Julie's life! The link is here: facebook.com/auntjulierich. Thank you on behalf of my mother, Frances Rich, my sister Arlene Rich and of course Fox Mulder and Danny William. 27 July Went to doc, long story. Am wiped out. No new business for now including the sale I was having, and eBay auctions. NOPE. Sorry folks! On liquids only for 5 days and so on. Just too wiped out to do any Aunt Julie biz. More later. What is Your Pet Really Thinking?! Their hidden thoughts, dreams, fantasies, goals? Why they seem so stressed out? If they like their name? What they think of you? If they know what's really going on?? How they felt about their passing over? They want to be heard! to Aunt Julie's Pet Communicator Web Site! THIS IS "THE HOME PAGE"! 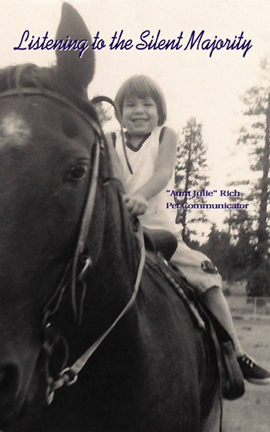 My name is Julie Rich, also known to local pets (and their owners) as "Aunt Julie". 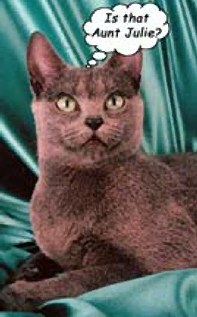 For quite some time I have been able to have very good communication with animals and have gained a reputation as being the local "Pet Communicator", "Pet Psychic" or "Animal Communicator". Some have heard or used the terms "Pet Translator" or "Pet Intuitive"; all of these terms are pretty interchangeable, but many are unsure what they really mean. "Whisperer" is another one that's been floating around a lot. As you may have observed, "talking" is not necessarily a full "communication". Often the missing ingredient is understanding what's actually being conveyed said. This is true with animals as well as humans and nowhere is it more obvious than in the relationships between the two! Further, both ends have gotten used to depending primarlly upon "body language" and some customized noises at thier end and that's great - nothing wrong with that! but as you well know, there's something more going on behind those eyes and you're probably just not gettin' it. With animals, especially those with whom you have a lot of dealings, you may wonder if they really got what you told them. You explain why they must go to the vet, or that you're getting married soon. 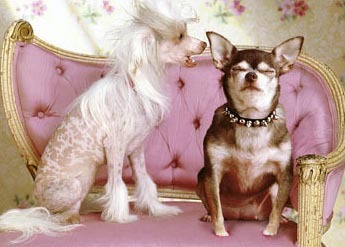 You tell them you got them new yummy dog food! but did they get any of it? Why don't they act like they do? Why don't they retain anything? Why do they continue to wag their tail when you tell them you're about to go to the store without them - if they really got it? . You ask some non-sensical question to "test" them and they grin away no matter what. What's going on!! What part of this "communication" are they really getting? Or are they getting anything at all? Is it all stimulus-response? Is anyone home? What is their attention span? Their retention capacity? Do they listen to language, read your minds, both, some combination.....or WHAT?!?!? They have active, vital thought processes no different than you and I. Exactly the same, as a matter of fact. Theirs are simply geared toward, evolved around, concentrated and focused on, things of matter to their survival and interests based on their species, and their attention spans and depth of understanding of whatever the subject matter is. Hey - if you don't understand Advanced Calculus or how a city plans its roads, you won't spend long stretches thinking those concepts through. If they don't understand tax planning or how babies can be tax deductions, they won't think about that either, nor will they overall seem to have the capacity to understand the "same way" as we do. Where does Aunt Julie fit in? LIVE - INTERACTIVE - YOU AND I ON THE PHONE, WE'RE TALKING WITH YOUR PET RIGHT THEN AND THERE. My services are available to anyone seeking to understand animals better, improve their relationship with their pet and/or animals in general. Understanding and Translating. This what I do for you and your pet (or any animal even if not your pet). They get your thoughts, concepts, ideas, notions, considerations about things, and...they hear your words, understand them, get what you're saying, can understand, and can understand. So why does it get so weird? Why doesn't the above seem to be so? My site covers a lot of how and why this all is this way. Feel free to read up on it (FAQs are the best place to start). Doing a "communication" or "reading", as many call it - I refer to it as a Consultation - with you and your pet clarifies the rest of the how and why. That is, Yup, you pretty much need to experience things for yourself. As an Animal Communicator, I will ask your animal companion all those questions you've always wanted to ask and pass those answers on to you, right there on the spot. This is quite easily and deftly done, and you will find it a lot simpler and easy to understand and participate in than you are imagining right now! We do it together, and you're in on the process as it's happening. It's more or less like a "three-way phone call". People are always amazed at how much closer they feel to their pets once they've had the opportunity to see things through their eyes. Pets like the experience too because they now have a chance to tell you the things that are important to them. An Aunt Julie CONSULTATION is what some call a "Communication" or perhaps "Session" or "Reading". It is the time you and I spend talking with your pet (or any animal being). I call it a Consultation so that it doesn't get mixed up with what everyone else does or says they do. My services are available to anyone seeking to understand animals better, improve their relationship with their pet and/or animals in general, who would like to know what's on their pet's mind, and other common concerns of pet owners and animal lovers. Please feel free to browse around my ever-growing web site...learn, enjoy, and do contact me so I can help you with your best friend...remember, everyone has something to say, and everyone wants to be heard! It ain't just about the "bad" stuff! I am a crusader for Hearing the Silent Majority. Your animal friend will greatly appreciate being heard by someone who understands specifically what they are communicating, and having what they wish to say communicated to you (and vice versa). Don't you just want to know what's on their mind? It doesn't have to be "an issue", a problem, or something you want to say. They have things to say as well, even if it's just telling you how happy they are! I look forward to hearing from you about your pet or the animal you wish to help or know better, and working with the both of you to improve communication, resolve issues, answer questions, handle upsets, and the like! It's fast, effective, often eye-opening and startling, and certainly one of the most rewarding experiences around! Please feel free to contact me with any concerns or questions petcomm@aol.com. Oh - and please note that International calls are now available with low cost rates! Now, if you're ready to proceed, though, simply go to the appropriate Order Form page (living animal or passing over/passed over animal) and take it from there. YES, you've come to the right place! Navigation links are on the left frame and on the top part of each page of this site. Each page has a Back button at the bottom of the page so you won't get lost! 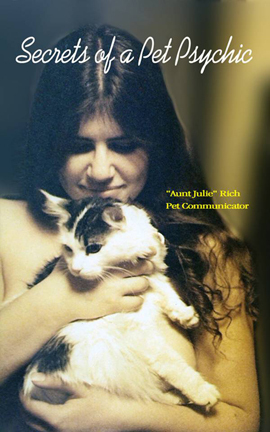 You can read up on How It All Works, what it's all about, what I do, etc., by following this link: Aunt Julie Rich Pet Communicator - HOW DOES IT ALL WORK? and reading the FAQs. The FAQs cover a lot. What can you expect? As they say, "Results may vary" but....Enjoy some interesting and informative TESTIMONIALS from satisfied animal lovers. Browse the left frame pictures, links and on this very page, mini-Testimonials...I call them Testimonial Tidbits. Basically, read up if you're so inclined (I recommend it! ), then go to the appropriate ordering page and follow the instructions there. Pay / send info & pic(s) / schedule in and we'll get started asap! You can contact me via email along the way as needed! Please do! Try not to get lost navigating all over the place! Only use it if you really need to. Ignore any ads they may add at the top, the right frame and so on. Just focus on the results for my site. Note also that it will open a new window within the window you are in. That is, the left frame you see will still be there and will also be "repeated" in the new window. Please use it very specifically, example: feral cats will get you lots of feral this and cats that. Quote "feral cats" unquote will get you just references to "feral cats". When done, use your browser's Back button to come back to this page. Want to see this site in its best light? Having trouble with some of the fonts? Download the fonts I used for creating it! OR let's get started and talk to your bay-bees!! All site contents Copyright (c) 2002, 2010 Julie Rich.